I knew one of the things I would enjoy about the new kitchen was being able to decorate the vent hood. I was a little surprised when I noticed that since Thanksgiving, when we actually moved back in, it has already been decorated three different times. It's been fun adding spring touches to the kitchen and I have just added some to the vent hood, so I thought I'd share some before and afters. As a kitchen warming present, our daughter gave us this rooster clock, the first thing used to decorate the vent hood. Next came the Poppytrail platter. I wanted to use the clock somewhere else so I put this up there for the time being. For a bit of spring I knew exactly what I wanted to use, Granny's dishes. Birds, birdhouse and blooms, these dishes are all about spring! Using a platter, two plates, salt and pepper shakers and the sugar dish, it was complete. I love the shimmer of the gold on the dishes, the sunlight just bounces off of them adding a bright and cheerful touch. Spring touches that didn't cost a dime! 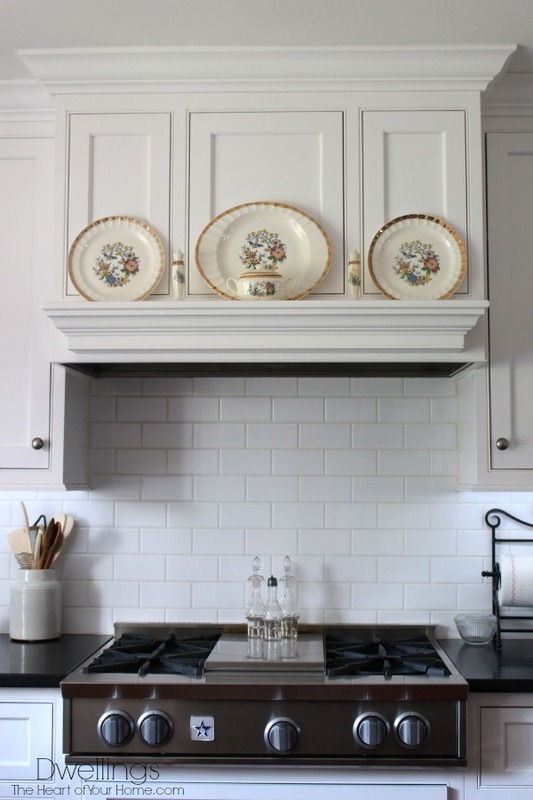 So far my no cost spring touches include the keeping room fireplace mantel, shared here, and now the vent hood. I hope I can keep the no cost thing going! 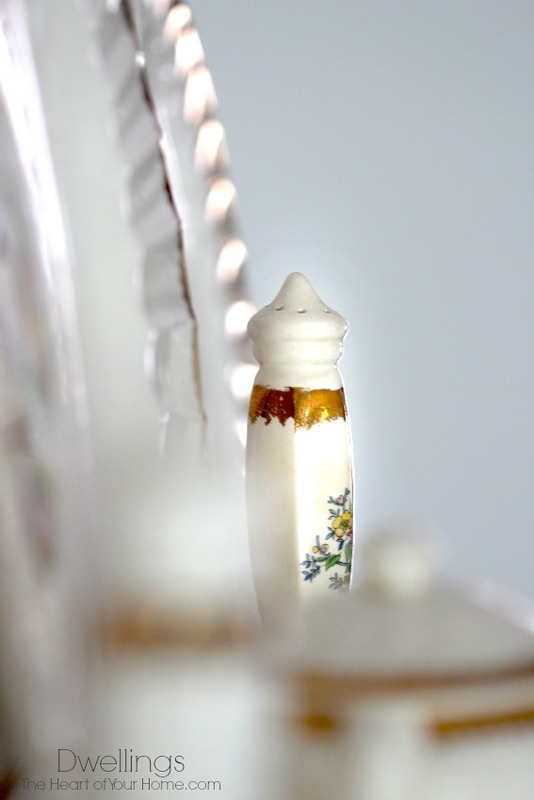 How about you, trying to decorate for spring with what's on hand? Great features and inspiration happening now at AMAZE ME MONDAY. Your range hood looks about the same size as mine,,except maybe your shelf is a little deeper. I too enjoy decorating it for the different seasons. Working on some spring decor over here as well! You have a beautiful kitchen!! Enjoy! 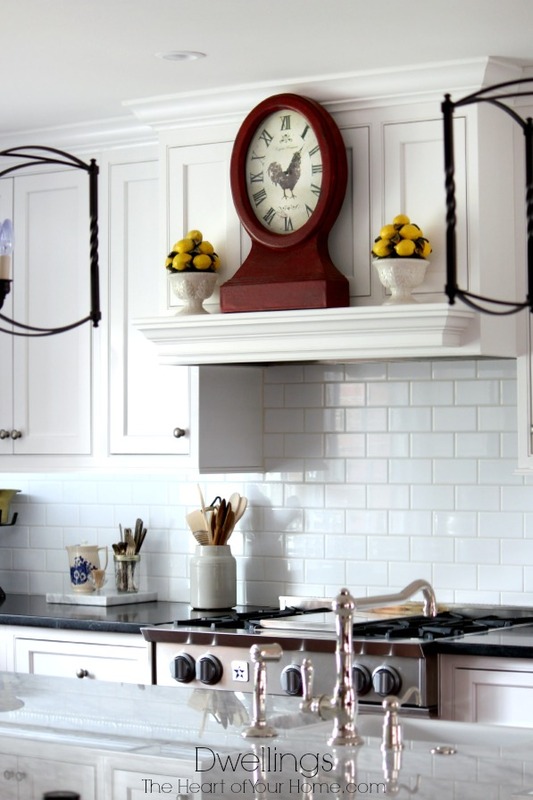 I absolutely adore the platter, dishes, salt and pepper shakers and the lidded sugar bowl on your vent hood, dear friend!!! Spring has arrived with a refreshing appeal!!! I, too, am trying to decorate with 'what I already have', but when making purchases, I'm being quite selective. Now that I've purged and donated many recently purchased items, I'm making more sound judgement choices. 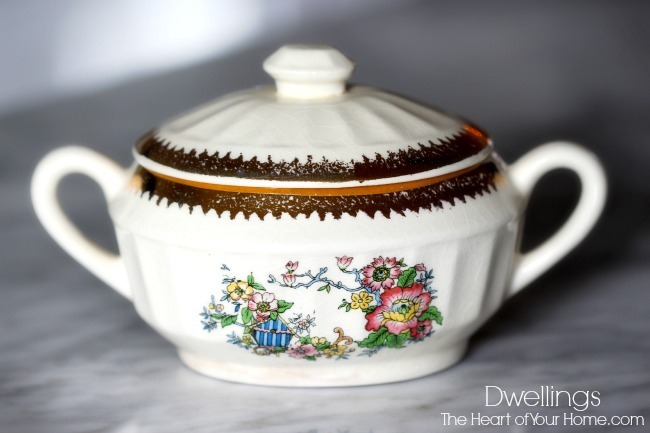 BEAUTIFUL Cindy...your grandmothers dishes are so pretty! 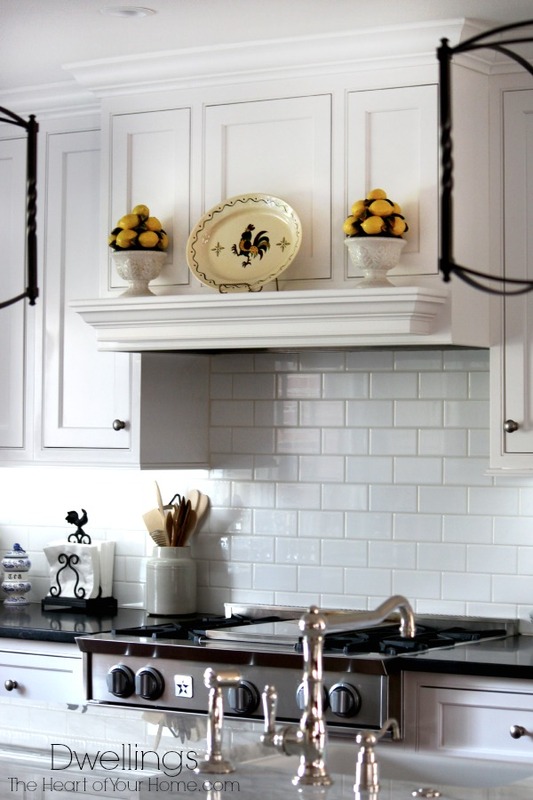 I love your range hood, Cindy, and it looks beautiful with your Granny's dishes! I love the Rooster platter too! 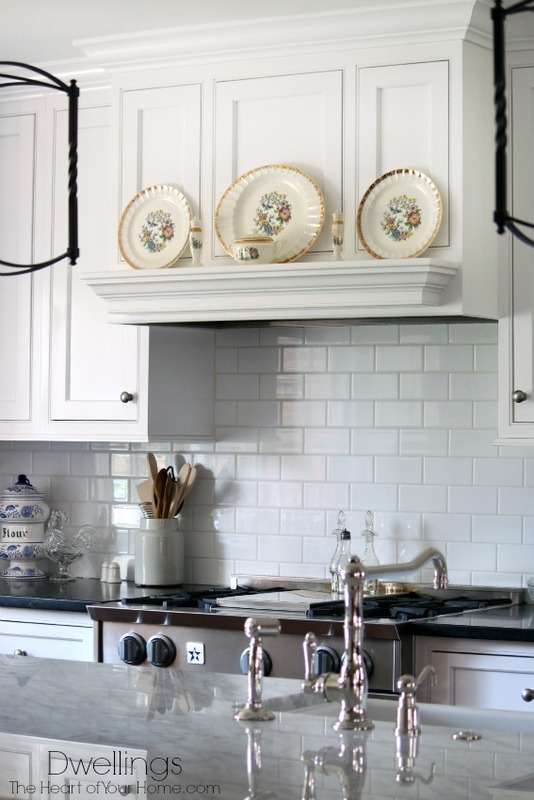 Oh, how I'd love to have a range hood - it's gorgeous! I'm a bit jealous. so beautiful, Cindy, love all the looks, but the china really does say "Spring"!! I think this arrangement is my favorite! I love how fresh and pretty it looks plus the fact that they have such meaning to you makes it even more special. My vent hood in our new house has a mantel with corbels and I can hardly wait to decorate it. Yours looks lovely in each of the ways you have done them. Always fun to stop by! I love those spring dishes: the birdhouse is so cute! Happy spring! Your dishes are lovely! I totally adore your kitchen. That clock is amazing. So fun. I love this. You have a gorgeous kitchen.